Bengaluru FC came away with a 0-1 win over Salgaocar FC at the Nehru Stadium, in Fatorda, Goa on Saturday to go top of the I-League table. 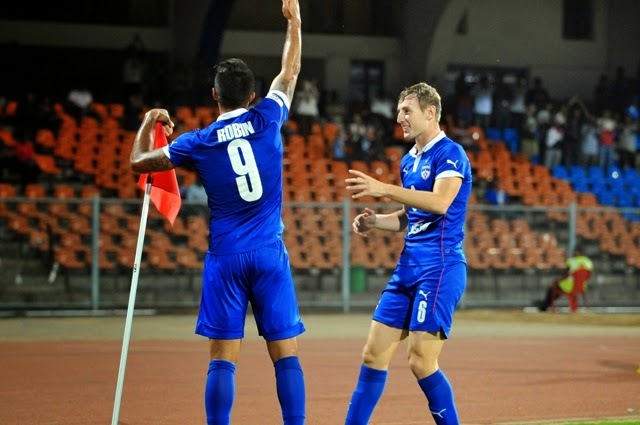 Blues striker Robin Singh scored the only goal of the game with a header in the 79th minute in a game that was bossed by the visitors throughout. Bengaluru Coach Ashley Westwood handed starts to returning India internationals Sunil Chhetri, Keegan Pereira, Eugeneson Lyngdoh and Singh as Bengaluru started on the front foot, stitching together meaningful passes and attacking the Salgaocar box from both flanks. The visitors’ first real chance of the game fell to skipper Chhetri who, after collecting Singh’s lay off, managed to lift the ball past his marker but only to shoot inches wide of an onrushing Salgaocar ’keeper Subrata Paul’s far post. The Blues’ finishing was found wanting for most parts of the first half as more shots from Lyngdoh and striker Sean Rooney failed to trouble Paul. The Salgaocar custodian’s stubborn stint between the posts saw crosses from Pereira and right-back Rino Anto safely pouched or punched away on numerous occasions throughout. Replacing Thoi Singh with Beikhokhei Beingaiccho, Westwood’s men started the second half with renewed vigour. Chhetri’s attempt to break the deadlock after being put through by Singh was once again thwarted by Paul. Heading towards the closing stages, Bengaluru’s persistence finally paid off as an expert cross was met with a header from the most acute of angles. Anto’s floater into the box seemed to have been overcooked but for Robin, whose arrival at the far post came with a thumping header sending the ball past a hapless Paul. However, the celebrations were brief as the home side came back with an immediate response to attack on the counter and win what seemed a controversial penalty. Salgaocar skipper Rocus Lamare’s run into the Bengaluru box was met by Blues’ substitute defender Lalchhuanmawia, who was harshly adjudged to have brought the midfielder down. Bengaluru ’keeper Lalthuammawia Ralte carried forward his man-of-the-match performance from the AFC Cup game against Warriors FC earlier in the week, diving to his right and saving Gilbert Oliveira’s spot-kick to protect the Blues’ slender advantage. Salgaocar’s night went from bad to worse as defender Gurjinder Kumar received his second yellow and marching orders for a rash tackle on Beingaiccho with minutes left to play. Bengaluru next face Sporting Clube de Goa at the Sree Kanteerava Stadium, in Bengaluru, on the 31st of March.